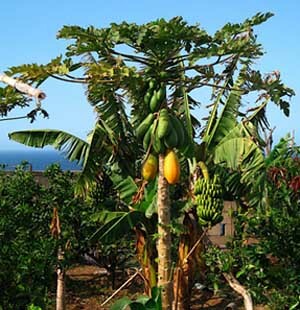 Bananera Jardines del Atlántico, Tenerife. Bananera Jardines del Atlántico is a theme park about the growth of native plants situated in the municipality of Arona, South Tenerife in the Canaries. This park offers a good example of the different cultures grown in the Canary Islands with a special attention to the canary banana. Furthermore, in its interior you might visit the interesting museum, Museo de aperos de labranza (Farm Implements Museum). South Highway TF-1, exit 26 Buzanada, Carretera Guaza – Buzanada, Camino Bananera, 16, Arona.